The Department of Horticulture and Crop Science at The Ohio State University/OARDC is currently seeking a Greenhouse Coordinator to manage staff and greenhouse and growth chamber facilities that are used for research in agronomic and horticultural crops. The position is located in Wooster, OH. Interested individuals may apply at http://jobs.osu.edu requisition number 419322. Application deadline is July 17, 2016. For questions about the position, please contact Michelle Jones at 330-263-3885 or by email at jones.1968@osu.edu. The OSU Floriculture Team is interested in hearing from you regarding the use of bioproducts in greenhouse production. Bioproducts are biologically-based products that can be used to reduce the need for synthetic chemicals during greenhouse crop production. These products include beneficial insects, biopesticides, and biostimulants. Please click the following survey link to participate – or go to http://go.osu.edu/bioproducts. The survey will take approximately 3 to 5 minutes of time to complete. Your responses will be used to help plan research projects and deliver programs that are relevant to industry needs. While your survey responses are anonymous, you may provide contact information if you wish to participate in the planning and implementation of grants, projects and programs in this area. Thank you for participating during this busy time of year! Best wishes for a prosperous growing and sales season! December 2014 saw the graduation of the first D.C. Kiplinger Scholar from the D.C. Kiplinger Crop Improvement Program at The Ohio State University. The D.C. Kiplinger Endowment, which funds the D.C. Kiplinger Floriculture Chair, was established at OSU in the late 1970’s. In 2008, when I became the D.C. Kiplinger Chair holder, I established the D.C. Kiplinger Award of Distinction to recruit top tier graduate students to the program. This graduate award was designed to provide some unique educational opportunities to floriculture students interested in learning how to apply molecular biology techniques to problems of relevance to the floriculture industry. 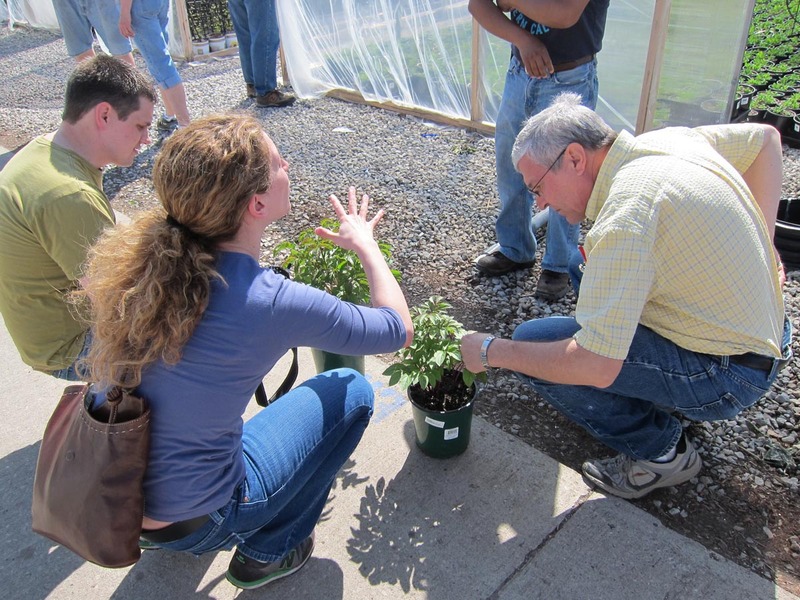 Students are also afforded the opportunity to collaborate with the floriculture industry through extension workshops and greenhouse visits with the OSU Floriculture Extension Team and through an industry internship. Shaun Broderick graduated with his Ph.D. from The Ohio State University in December 2014 as the first D.C. Kiplinger Scholar. Shaun was an exceptional student who accomplished a great deal during his time at OSU. 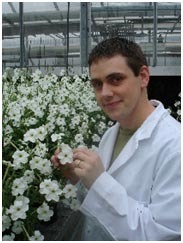 His dissertation research focused on optimizing virus-induced silencing (VIGS) in Petunia x hybrida (http://link.springer.com/article/10.1007%2Fs11105-013-0647-3#). Petunia is used as a model ornamental species and VIGS is used as a high throughput means of characterizing the function of different genes of interest. Shaun also completed a next generation sequencing project in petunia that identified over 4,000 genes that are potentially involved in controlling the initiation of senescence in flower petals (http://link.springer.com/article/10.1186%2Fs12870-014-0307-2#page-1). For his industry internship, Shaun spent a summer working with Dr. Alan Blowers at Ball Helix in West Chicago, IL. Dr. Shaun Broderick is currently beginning the next chapter of his career as an Assistant Professor of Ornamental Plant Breeding at Mississippi State University. Shaun Broderick collecting petunia corollas for his RNA sequencing project. Shaun conferring with Drs. Francesca Hand and Claudio Pasian during an extension visit to a local greenhouse.